This season Jason and I subscribed to the University Arts Series at WVU. Last month we saw RAIN: A Tribute to the Beatles which was so exciting since we bought The Beatles Rock Band as soon as it came out. 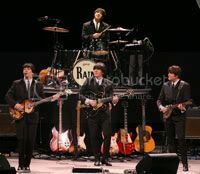 Sitting further away from the stage allowed me to imagine I was seeing Paul, John, George, and Ringo up there. RAIN's multimedia stroll through the ages completed the illusion for me. If you ever have the opportunity, I recommend seeing RAIN. This is a tribute band which goes the extra mile for a memorable show. Just last week we saw The StepCrew, a Canadian troupe featuring dancers, musicians, and vocalists: some of the troupe had a combination of these talents. I loved the dancing best, probably because I took thirteen years of tap as a child and teenager. Jason, of course, loved the music, probably because he has been playing guitar for over twenty years. Certainly something there for us both.